Recently, I was at a conference (or, rather, an event that’s more like a collision of deep experience, ideas and passion for social change) and I’ve since been stewing on notes, memories and thoughts pulled from truly insightful discussions. Two themes of this gathering happened to be theory of change and storytelling. Both were woven into presentations, discussions, random conversations at lunch, and have been present in ongoing interaction by and around attendees. Jonah Sachs led a great discussion about the principles of story that I wish more communicators and advocates could engage in (though he does have a book coming out on that…look for it next year). Jonah used a story, that of Moses and his quest to free his people from the Pharaoh, to help people understand the elements of a strong story. The rise of Occupy actions around the same time – from idea to tangible gathering in New York City to what seems to be a full-blown international movement – speaks to both themes as well. What, indeed, is the Occupy theory of change and what is the story being told? This post isn’t intended to be an exploration of the Occupy movement’s theory of change. One could debate whether there is even a theory of change present in the movement. By theory of change I mean “if we do this, this and this we will produce that result.” Occupy is trying to change culture to create sustainable societal change over time. That’s a long process that starts, in part, with storytelling. Perhaps it is no coincidence that personal storytelling has been an important piece of spreading the Occupy message. The We Are the 99% Tumblr has given people a medium to share their story – and that’s just one place where people are talking about their situation. Many that aren’t sharing their own stories on Tumblr and sites like these can see themselves in the stories told. It isn’t hard to identify with these people and feel like you share their values and see your story in their words. But, hooray, people are telling/sharing personal stories. That happens all the time online, in conversations with friends and neighbors, in community meetings, emails and more. Advocacy groups trot out “tell your story” campaigns aimed at getting people involved in policy change and, hopefully, a little more engaged in their organization. People post randomly on Facebook about an issue in which they’re interested. The nature of Occupy storytelling seems different, though. Stories are different and people are arguing about details of what should happen – there are even clear strains of Tea Party activism and Ron Paul libertarianism in Occupy – but there look to be shared values running through it all. There is a sense that we can do better, need to stick together, create a plan and share in the work and sacrifice needed to take care of each other. People matter more than corporations (or politicians) We need governance and leadership but not necessarily your/this government. Of course, that’s a personal interpretation of the story. 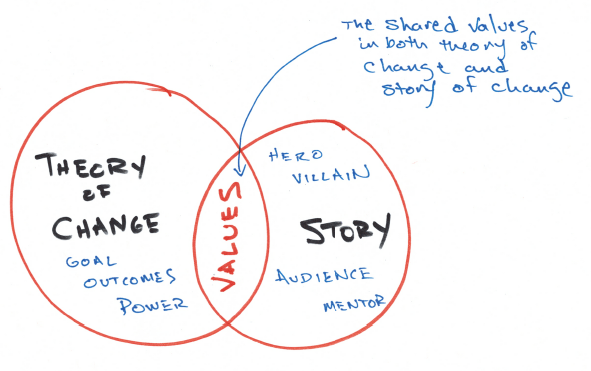 One page of the notes and thoughts I jotted down at this conference a few weeks ago included a little venn diagram I used at the time to explore the intersection of these two themes: theory of change and story. Each is powerful on its own and a key component of a campaign (advocacy, fundraising, even in marketing a product to consumers). These two elements are much more valuable together, though. So, what’s the commonality? Where is the intersection between theory of change and story that, when defined and used, invigorates a campaign or even a movement. Perhaps it comes down to shared values. I originally wrote “moral values” which is stronger but am hesitant to frame this discussion with the word “moral” because it has been loaded with political connotations. Shared values (or moral values if you like – or perhaps there is a better term) are key components of a strong theory of change and a good story. If trying to bring people together to take action you identify and appeal to their values, not their intellect and not the facts. Intellect and facts are debatable, easy to question. Values are deeper. Most anyone can identify and connect with the human values of liberation and persistence woven through a story of Moses and the Pharaoh. Those are values that transcend politics and religion. Appealing to shared values in one’s advocacy messages is nothing new, really. Integrating a story about shared values with a clear theory of change is hard, though. I would say that your internal team and strongest activists need to be clearest on the theory of change part. They need to know it back and forth to weave it into messages and stories. The audience, constituents, community need to connect with the story. It is what brings them in, keeps them there and compels them to act and spread the story. Aligning shared values across the inside and outside groups (the theory of change and story) will be the special sauce that keeps the campaign juiced and moving forward.